The little Briar Rose who was cursed by an evil witch. Why? Because the witch was not invited to the festival held by her parents upon her birth. The beautiful princess fell asleep after pricking herself with a spindle. As every story needs a terrifying witch, it also needs a handsome prince. After a hundred years of solid dreaming, he kisses the sleeping princess and they live happily after. Edward Burne Jones is a renowned English Artist and Designer, who worked in stained glass and painting as well as many other crafts. He depicted the sleeping scenes of "Sleeping Beauty" tale on a series of paintings which he called "The Legend of Briar Rose". Adina, the founder of a-england nail polish brand must have seen many sleeping beauties on our fingers and decided to wake them up with her new collection, dedicated to Burne-Jones' The Rose Bower painting series. The collection is composed of five nail polishes but at the moment only four of them are released. The fifth one which is not reviewed below is called Briar Wood and is described as deep vampy red scattered holo.You can check the availability of the brand on their web page under where to buy (not an affilate link). Appropriate to the floor decoration on "Rose Bower" painting of Burne-Jones, the first nail polish I would like to introduce you today is a gorgeous red with subtle holo effect. A-england makes some of the best holo nail polishes out there but up to now the collection was lacking a true holo red. Adina must have felt the longing of her fans and crowned them with a gorgeous one coater, Rose Bower. After being a fan of the unique finish of Parceval from a-england, I was not suprised how much I loved Rose Bower too. I used two coats to strengthen the holo effect but I might have stopped after one coat which gave me the perfect coverage. The fated prince who kisses the princess good morning will also wake up the beauty of our nails? It has an anthracite base but leans green. It must have been because of the stain of the vegetation surronding the palace upon his arrival ;-). A tad more thinner than the rest of the nail polishes in this collection, Fated Prince is perfectly opaque after two coats. I used two coats for the swatches. On the nails, its holo particles of gold and green are stronger than Rose Bower which makes you go wow under sun light or artificial light alike. Another great formula, not too thick but manages a perfect cover with just one coat. Sleeping Palace makes your dreams come true! The last piece I would like to introduce to you is called after the name of the painting series and the tale itself, Briar Rose. As I am typing these lines while wearing it, needless to say that it is my favorite of this collection, a purple leaning rose with gorgeous multi colored holo. I love everything about this polish, how metallic and streak free it looks, where exactly the base color stops between pink and purple and how gorgeous its wearable holo effect is under any light. Another one-coater and needs a big applause. 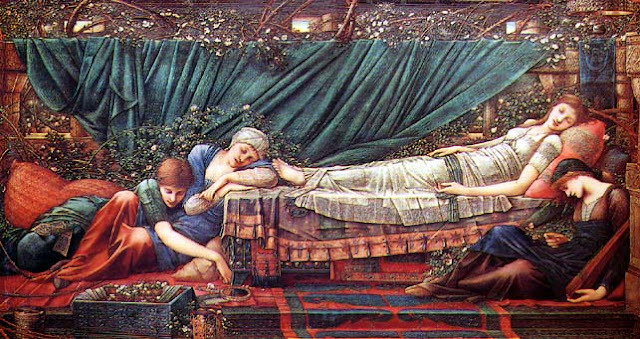 Final thoughts: Another gorgeous collection from a-england, inspired from Sleeping Beauty painting series of E. Burne-Jones. Three of the four shades (Rose Bowel, Sleeping Palace, Briar Rose) are one-coater and the fourth shade (Fated Prince) is perfectly opaque in two coats. The base coats are complex and beautiful, holo effect are visible yet wearable. My personal picks are Sleeping Palace and Briar Rose. I purchased mine from Lovely Cosmetics, costs 10,99 EUR for 13ml. bottle. Do you like holo finish? Have you tried a-england yet? OOO Fated Prince is my favorite out of the bunch! I own some a england nail polishes and love them a lot. I should look into these! Yes they definitely are! Love them all. They really are, I love the wearable holos like these! Every shade is so gorgeous and fyi love sleeping beauty haha.